HI JUST A LITTLE ABOUT MY FLY BUISNESS. 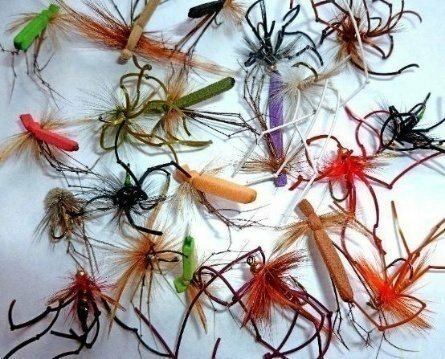 I have fished for over 40 years and started A1 TROUTFLIES about five years ago .initially started selling on eBay but I got fed up with giving them all my money. So I found a great website provider in the form of a company called Create [ https://www.create.net/?source=footer]. I have now spent hundreds of hours or even probably thousands of hours on building this up to where it is today. Most of the flies I have are mainly geared up for Stillwater trout fishing but I am slowly starting to put in river patterns also. You will find old time served patterns and my own modern designs all within the shop. The adult crane fly has a slender body and long thin gangly legs that are deciduous, easily coming off the body. The wingspan is about 1 to 6.5 centimetres. The antennae have up to 39 individual segments. The Daddy Long legs is actually a large type of crane fly, of which there are 94 species in the UK. Familiar to all of us in its adult form as the gangly insect that flits around our homes in summer, the larvae of the Daddy Long legs are grey grubs (also known as 'leather jackets') which live. The adults are on the wing during the late summer and are common in gardens and fields, often coming indoors. They rarely feed at this time, concentrating on mating and laying their eggs amongst the grass. For the fly angler you can fish imitations of these as either a wet fly or a dry fly ,when fishing the dry fly pattern I either leave them to drift in the wind or give them a slow figure eight retrieve with occasional pauses in between. As a wet fly these are sometimes called vibrating daddy’s ,Gold head daddy’s and are best fished on an intermediate line with a figure eight retrieve. However you fish them takes can be either gentle or fast, and my personal preference is to fish these in autumn on a dry line. Dan Byford created the Zonker, The fly was an instant success and has become a 'must have pattern' for still water fishing. It can a deadly Attractor Pattern and an exciting bait fish imitator as it Stimulates and triggers explosive takes from large predatory Trout; it also works as well in rivers and lakes as it does in Stillwater fisheries and is most productive during the winter months. Try to mimic the movement like small fish swim. But vary the retrieve from slow and steady, fast, strip-and-pause, or quick, short two-inch strips until you find what works best to induce a take. Hi and welcome to www. A1troutflies blog. The cats whisker was invented /created by mr David train in the 1980s, it is one of the most succesful patterns to fish due to its movement in the water ,constructed with flowing marabou tail and wing and chain bead eyes to make it sink quickly it can be made to shimmer and dart about like a real minnow.many variouse methods of retrieve can be used but the one i personally favour the most is to just cast out let the lure sink ,then give a slow pull of about an arm's length [this will make the fly rise up in the water] leave it alone for a few seconds to let it sink back down , then continue with another pull. strikes can be either gentle or hard-hitting so be sure that you are always in contact with the fly. The original colour was white marabou with a green body ,and i still find this the most popular colour combination used ,however here at WWW.A1 TROUTFLIES we offer a selection of various combinations for you to try .